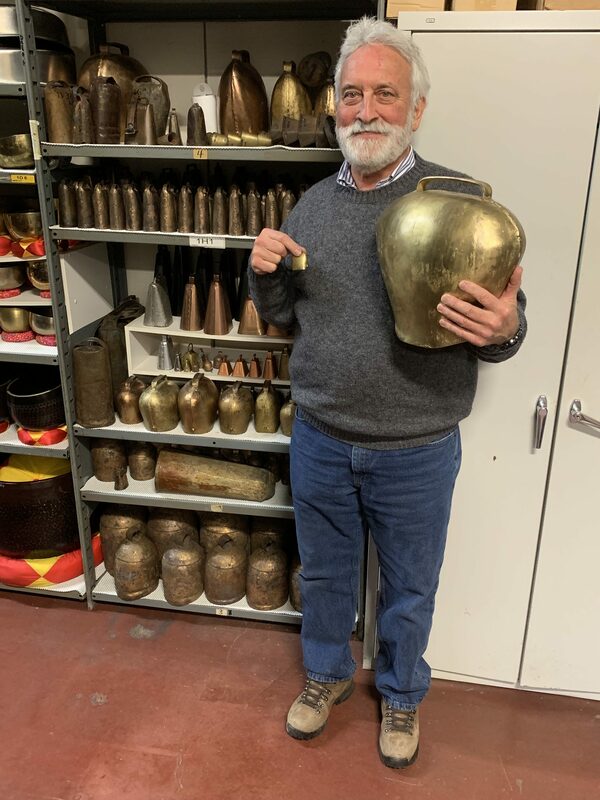 Garry in front of his cowbell collection – Diane says “no more cowbells! I have an extensive collection of a few hundred cowbells, ranging from tiny to gargantuan, which makes the famous Saturday Night Live skit “More Cowbell” ring a bell with me, so to speak. I even incorporated a Dharma Cowbell into the Woodstock Chimes line, so popular it’s out of stock at the moment! It’s funny (literally) how certain things become ingrained in our culture and endure for generations. The SNL skit with Christopher Walken and Will Farrell takes place in a recording studio where Farrell is the cowbell player in a fictionalized version of the Blue Öyster Cult rock band. Jimmy Fallon, who keeps cracking up, is the drummer in the skit. It is often listed as the number one SNL skit of all time. The band members stop playing several times during the session to complain about how loud the cowbell is, but Walken, playing the role of a famous producer, keeps asking for “more cowbell.” Near the end of the skit he lays down the line, “I got a fever and the only prescription is more cowbell.” Of course, it is made even more hysterical by Farrell’s wild dancing with an extremely tight shirt that exposes his belly. You can read more about it on Wikipedia or see it in the NBC archives. Here’s an old New Yorker cartoon that’s relevant. I can’t tell you how many times the line “more cowbell” has been used in sessions I have been in when the producer wants someone to play louder. I am constantly surprised when I hear it said in normal conversation outside of a musical context, too. I hear it from teenagers who weren’t even born when it was aired in 2000! It seems that everyone knows the reference. I say “More Windchimes,” but you never know when you’ll need a C# cowbell.